Yes, it’s true that us Madrileños have seen it time and time again. But…have you? You can’t come to Madrid and not see it! The Puerta de Alcalá (Alcalá Gate) is one of the emblematic images of the capital and although we that live here see it from a distance almost every day, we still hold a special love for this historical arch. As a matter of fact, the last few times that I stopped by to see it, I felt nostalgia akin to how you feel when seeing your own city after being away for a lengthy period of time. I recommend that everyone sees the Puerta de Alcalá on special occasions such as the Noche en Blanco (White Night), where it has a special charm being lit up all night. Also, you should read about its history on Wikipedia or another similar website. You’ll love it. The best photo of the Puerta de Alcalá has yet to be taken. Maybe it’ll be yours! 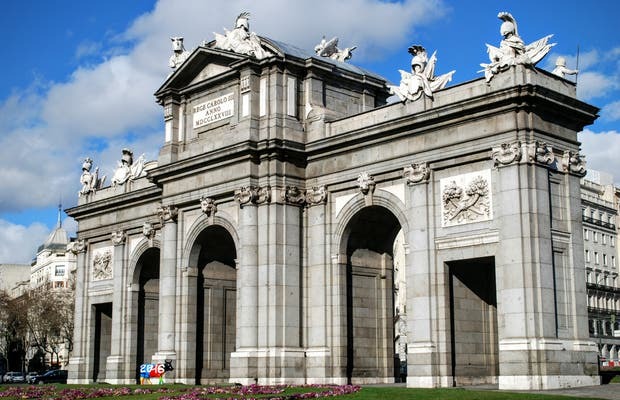 In Plaza de la Independencia, at the intersection of Alcalá and Alfonso XII streets, very close to the famous Plaza de Cibeles, there is the Alcalá Gate (Puerta de Alcalá), one of the most famous monuments in Madrid. This monument created by Sabatini is of neoclassical style and has three arches and two squared doors. It was completed in 1778, after 9 years of labor, and was built with granite from the mountains of the province of Madrid. It used to be the eastern limit of the city, and served as an entrance and exit, being located on a sheep track. "Mírala, mírala, mírala, mírala. ¡La puerta de alcalá!" ("Look at it!... ", lyrics of the song about the Alcalá Gate). One of the places that, God knows why, makes one get goose pimples just looking at it. When I go to Spain I will go there again and I will tell her: "Viste que cumplí, acá estoy yo de nuevo"... (lyrics "See I kept my word, here I am again").